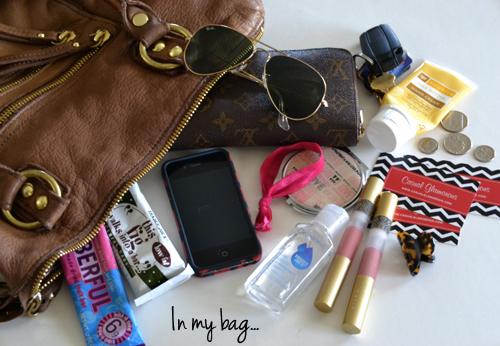 I love when other bloggers offer a glimpse into what they carry in their purse. I don't know about you, but I'm always interested in what other women carry around with them. I tend to prefer bags that are soft and slouchy vs. stiff and structured for everyday use. My Linea Pelle Dylan is typically my go-to bag. It's roomy, has a nice long strap so I have the option of wearing it on my shoulder or cross body and has super soft leather which I love. What do you carry around in your purse? nice! my bag is a total mess after the holiday! will have to update you on my belongings once its cleaned! love the business cards! He he in mine you find my work laptop + batterie + YSL lipstick/Iphone/wallet/ ray bans/ keys. Seriously sometimes I wonder how I carry all that ! Such a cute idea! Love the business cards! Your bag is far neater than mine! I love love love the emi-jay hair ties…I can't have too many! You mean you don't have 15 receipts floating around at any given time?? always love seeing what other women carry in their purse! Everthing you could ever need on a daily basis!! I need to get some of those color hair ties! I am with you 100% on soft and slouchy being better for everyday. I'm the same way! Love your business cards too! I love these types of posts :) It's always fun to see what other girls are carrying around! i always have one of those hair ties on my wrist! and i REALLY ought to carry my business cards with me more often! =) thanks for sharing...i love these posts! have a great weekend! You picked good snacks :) And those business cards are darling! I usually just carry my wallet, a little extra makeup, and a pair of sunglasses...although occasionally you'll find a book stuffed in there too! Haha, I can also not live with too tiny bags on a normal day :) Your businesscards (?) look great! loving those business cards! I want to have some made for the upcoming IFB and luckyfabb conferences. Did you get them done locally or online? Thanks Ashley! I ordered them online from some random business card website. Yes, you definitely need them for those conferences. They were really inexpensive too! I love your business cards! I have some for my personal shopping/stylist business but need to add my blog to them. i love these posts too! thx for sharing! Can't leave the house without hand sanitizer and bars, haha! ooo where'd you get your business cards?? Hope you and the bump are doing well! I love these posts. Why am I so interested in what bloggers keep in their bags?? ?